Are the 76ers still not built for the postseason? 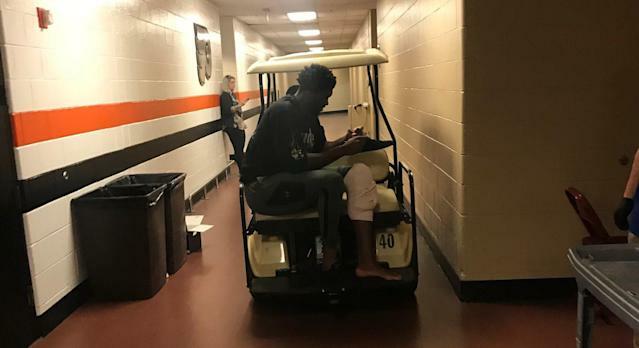 PHILADELPHIA — Golf-cart-riding Joel Embiid, doing everything he could to improve his mummified left knee, ran across a tight space in the back hallways of the Wells Fargo Center and needed assistance to get through. No, it wasn’t a gang of Brooklyn Nets giving him the treatment they did during the Philadelphia 76ers’ opening-round loss Saturday afternoon, a 111-102 decision that didn’t feel as close as the spread indicated. The Nets didn’t steal Game 1. They took it, held it up high and played keep-away like a big brother toying with a younger one. They swarmed Embiid, double-teaming him, fouling him and, when prudent, leaving him alone to shoot open threes that didn’t find the mark. They found a way to use Embiid’s supposed inspiration against him, as he was a game-time decision and wasn’t sure he would play until 20 minutes before tipoff. That early adrenaline pushed Embiid into shooting himself out of the game and the Nets into it, highlighting all the ills the 76ers couldn’t overcome and giving credence to why many feel this group is as vulnerable as any 50-win team this postseason. Was it Embiid’s 1-of-9 start that kept Tobias Harris from getting involved? Or merely the thought that this team has been cobbled together over the past few months with barely a foundation to speak of aside from Embiid and Simmons? It's hard to believe this franchise made the second round last spring, but when you consider they hovered around .500 before making an improbable run last season, perhaps too much was added too soon. The Nets, the real playoff neophytes, looked poised as they withstood emotional bursts from the home team. You forget it’s a new scene for Caris LeVert, D’Angelo Russell and Spencer Dinwiddie, but at least they aren’t new to each other. Russell shook off a 1-of-9 start to score 26, while LeVert continued his new life following that ugly-looking ankle injury to score 23. Dinwiddie played like a man who’s been waiting for this for quite some time, dropping 18 and adding a few smirks as he watched the 76ers look around for somebody, anybody, to help. “I think as they gain experience together, they'll just know,” Dinwiddie said to Yahoo Sports about the 76ers. “They'll kinda be on autopilot of what they're trying to do and what they're trying to look for when the chips get down. For a team that's still trying to jell together, they get some of that, some of those question marks. The pressure of the game, and of the circumstances, are in the air. The 76ers have big dreams, and owner Josh Harris reiterated he wants to keep this group together. Butler, Harris and Redick are unrestricted free agents, Simmons is up for his rookie extension this summer and 76ers coach Brett Brown’s job security has been fodder for speculation for months now. It makes for a tricky situation, doesn’t it? Eyes are open, and perhaps everyone is realizing you can't ‘just add water’ to make a contender.